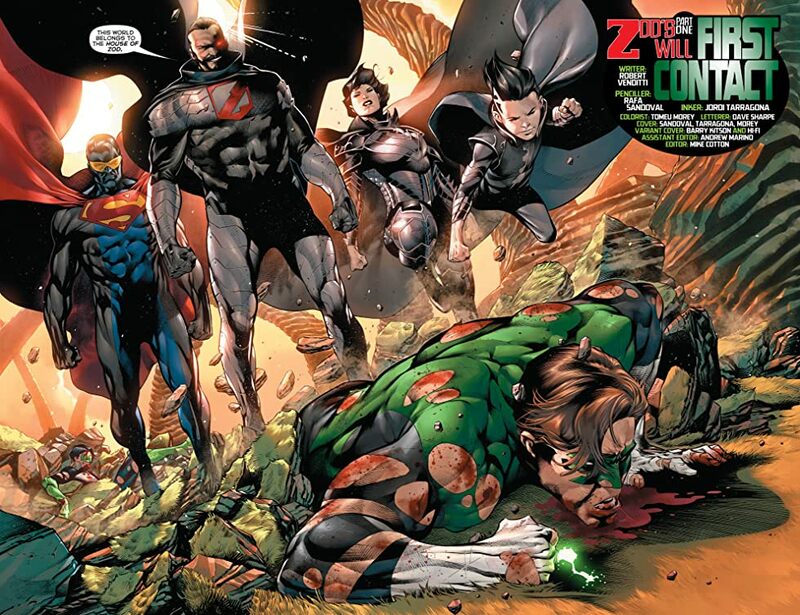 It appears Zod and his 3 Kryptocronies have moved off planet, Planet Jekuul to be exact, and have just kicked the snot out of GL Hal Jordan (and K. Hanger-on Rayner). [Their last stint was in Action #984, right?] And SPOILER: Jon doesn't. Who's in? Support Cancer Research and Alzheimer Research. A fine issue, I have intended reviewing it before now. 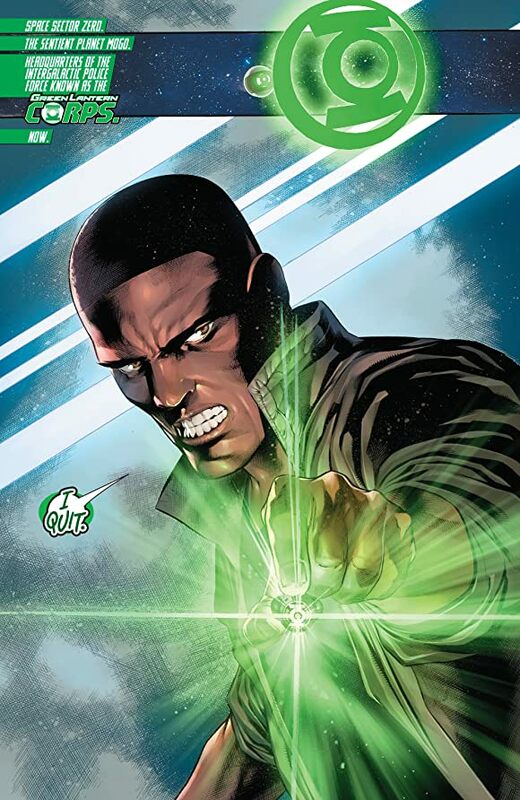 I am, and for the most part have always been, enthusiastic about Robert Venditti's work on the title, he has added a great deal of depth and further range to Hal Jordan's character and while Green Lantern has a record for co-opting Superman villains the choices are logical ones and add substance to what a Green Lantern should be doing out there. 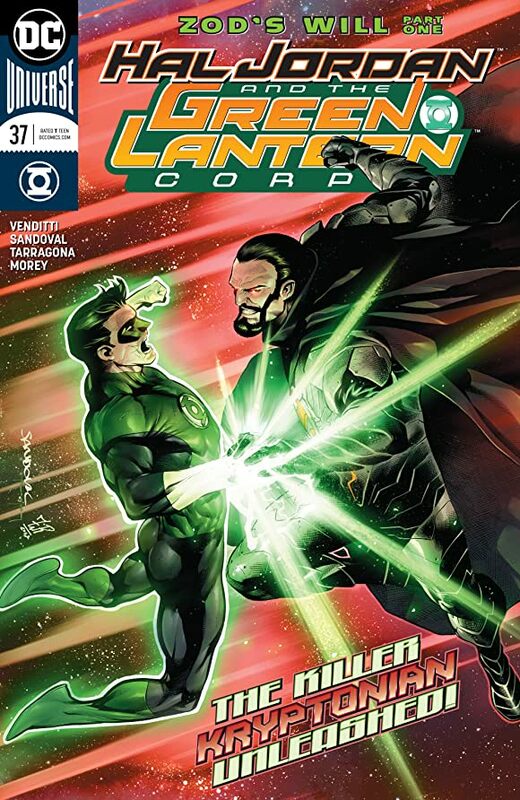 The commitment to finding worthy problems and opponents for the Green Lanterns has been well met since the great 2005 revival, and taking the opportunity to pick up on Dan Jurgens' loose plotline from Action Comics to look at a more political and ethical problem in the form of an alien dictator posing as a worlds saviour and protector is ground well worth treading. General Zod is an unusual and surprising selection to appear in the book, but then this is precisely what made the story unfolding here so memorable and strong. In some ways one can see aspects of Sinestro's psyche and idiosyncraticies on display in him, where he steps above the Korugarian however is in sheer physicality, as proven graphically herein Zod's will is made manifest with the full power of a Superman. 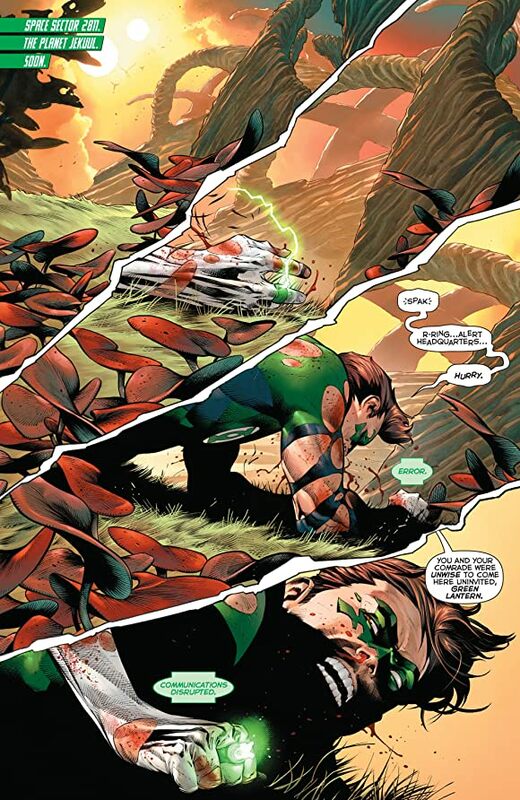 Hal Jordan may or may not be more powerful potentially, but against an opponent who's will and ruthlessness is a match for Sinestro's, and has the physicality to be literally unstoppable, irresistable, Hal Jordan's limitations as a man and a Green Lantern cannot help but be shown as utterly inadequate to the challenge. The intriguing dilemma for the observor, i.e. the reader, is whether Hal was even correct in so instantly dismissing any question of mediation or due sensible caution when the General unexpectedly greets he and Kyle - with the opening of the issue focusing on John Stewart's reaction to the re-emergence of the Guardians as a clique and his well regarded role as communicator and part-politician would he have reacted with more due caution perhaps...? But it is entirely in keeping with Hal's known tendency to react on impulse and instinct that he so rashly does so. Clearly he knows who and what Zod is, how we can only guess at, and one has to ponder whether it was Zod's obvious similarities and personality traits to Sinestro that triggered the immediate reaction from Hal. A very good issue, a great credit for artist Rafa Sandoval too as the layouts and design choice for the flow of the story and the terrifying arrival of the House of Zod into the proceedings may well not have been so powerfully done as a production if the artist was any other. In all the best ways Green Lantern #37 was the best of the weeks picks. Politics, Power, and The Black Panther. A Commentary On Wakandan outlook and Monarchy, By Jeffrey Kahan. Doctor Who - Nothing at the End of the Lane #4. Hal Jordan and the Green Lantern Corps #41 - The Law and The General.